For the past 5 years we have done themed costumes, the difficult part is getting everyone to agree. This year Jude decided that he wanted to be Alex the Lion from the Madagascar Movie, and so we started. My children are wearing the costumes. Jude age 5 is wearing Alex the Lion costume. The lion head costume is made of cardboard from pizza boxes, multi assorted-chip boxes which make up the forehead, ears, and mouth. The mane is also made form the multi assorted-chip boxes and brown bed sheet. The body was material bought from a thrift store. Emilio, age 8 is wearing Marty the Zebra costume. The Zebra head and snout are also made from pizza boxes, multi assorted-chip boxes. The zebra print clothes were altered from a lady's dress bought from a thrift store which was altered with legs and a front chest piece. The zebra is wearing a long sleeve white shirt and long white socks. 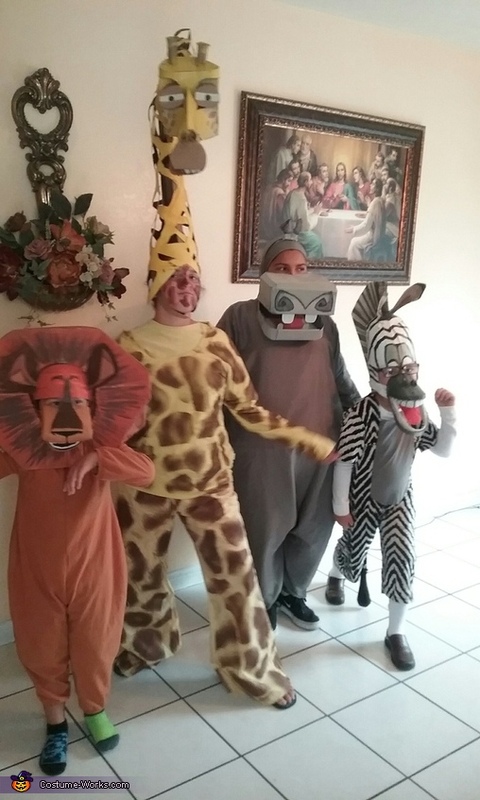 Juliette, age 12 is wearing Melman the Giraffe costume. The Giraffe neck was made from poster paper, cardboard, and duck tape and wire to help hold the Giraffe head. The Giraffe head was made from cereal boxes. Cardboard straps and elastic bands were used to attach to her head. The poster paper was cut into shapes which was used as a stencil for the spots on the clothes. The clothes were pajamas bought at a thrift store and altered. Brown and yellow spray paint was used to make the spots. Sofia, age 13 was wearing Gloria the Hippo costume. The hippo mouth was made from a shoe box, which was altered with cuts and duck tape to fit around the noise. The head peace was made from gray bed sheet which was tied in back. The hippo ears were made from bed sheet material and then duck-taped to a headband. The mouth and headband were spray painted gray to match. The hippo body was made with hula-hoop’s, with duck tape straps at the shoulders, then covered by a gray bed sheet. The bed sheet was altered for arms and legs and sewed.